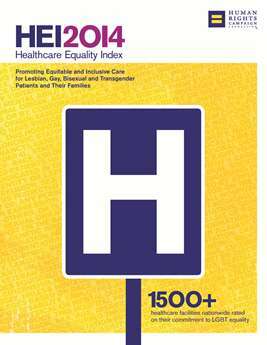 The Healthcare Equality Index (HEI) was founded as a joint project of GLMA and the Human Rights Campaign Foundation. The HEI is the national LGBT benchmarking tool that evaluates healthcare facilities’ policies and practices related to the equity and inclusion of their LGBTQ patients, visitors and employees. Since 2007, this unique tool has guided hundreds of healthcare facilities seeking to provide better and more equitable care to their lesbian, gay, bisexual, transgender, and queer patients. For more information and/or to register your facility to participate in the HEI, go to www.hrc.org/hei. Click here to download the 2014 HEI. Click here to view the press release announcing the release of the first HEI in 2008. Additional resources available at www.hrc.org/hei.